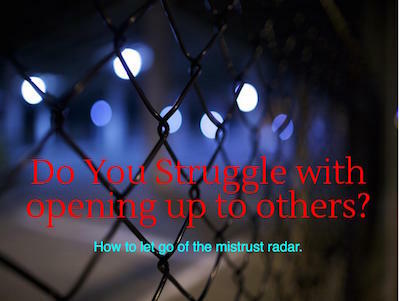 10 Ways to Let Go of the Mistrust Radar? Do you ever wonder why some people can breeze through life with confidence and calm when you are quickly consumed by thoughts of danger and betrayal? Your instincts are needed to tell you when there is a threat, and you are unsafe. When those instincts are on constant alert, then you are receiving faulty information and it makes it hard to trust people. What causes you to be on constant alert for betrayal? Let’s start with a simple understanding of what is happening in our nervous system. There are three parts to your nervous system that work together to help you deal with and make sense of the world. Social engagement is the part of your system that helps you to connect to others. It involves your face, eyes, ears, and voice and connects to your heart and guts. Fight or flight. Emergency centre. Increases energy, heart pumps faster, muscles tense. You are ready to deal with a threat. Living with a parent who is depressed. On the other hand, feeling safe and secure also occurs through your connection to others. It is their compassion, support, and caring that increases your sense of security and that you are not alone. Also, feeling connected to nature can enhance your sense of wellbeing and that you belong. When you have a build up of unprocessed threat and stress your social engagement part of your nervous system becomes disengaged. You will become disconnected from yourselves and others, and go further into an emergency alert. At the first signs of discomfort, your social engagement will still be active. You can use your eyes, ears, and voice to engage others and try to mitigate the situation. If the uncomfortable signals continue to increase and reach levels that are overwhelming, this triggers your fight or flight. The connecting part then goes offline. You are then prepared to fight or flee a situation to survive. You might use anger and protest, or refuse to be coerced, or if necessary use physical defence. Other than literally running when you feel threatened, you might withdraw or try to be invisible and silent. Freeze kicks in when you are unable to fight or flee, and your only option is to leave mentally. One aspect of this is called dissociation. So as the threat continues, you protect yourself by collapsing into inaction and not being present. When you have space and support to recover from trauma and stress, your social engagement system has the possibility to reactivate. If not, and you continue to experience being let down or threatened by people in your life, relating to others is shaped by the fight/flight and freeze parts of your nervous system. As you relate to others from a constant alert, then patterns of mistrust develop. When you are on constant alert there is a sense of protecting oneself and ‘making sure’ you ward off danger. Right? Ironically this leads to experiencing the world and others as unsafe because you are stuck in the traumatic fear when there is no threat. With this perspective and response going on in your nervous system it is easy to see how you would end up keeping to yourself and fear being vulnerable with anyone. You end up looking for ways others are going to let you down. You have developed a mistrust radar. Awareness is always a major factor in any process of change and healing. So becoming aware of how your nervous system is keeping you stuck on alert will help you to work to change your actions in response to it. Many people are so used to operating this way it has become automatic and so to notice the fight/flight or freeze activation takes practice. Mindfulness practices can help to bring focused attention to the sensations in your body. Learning to relax the alert activation. There are many ways to calm and soothe the fear and tension that you notice in your body and thoughts associated with this. Meditation, yoga are all good practices for this, but to learn to calm the fear as it arises is key to changing the mistrust radar. in your thinking that prevents you from taking in new experiences. Connect with things in your environment that give you a pleasant feeling. Anything from a colour you like, something in nature, a person you do trust, a smile from a stranger. Slow down and take it in. Connect with the sensations in your body that you associate with noticing this. Notice how much you can tolerate without going into the fight/flight. Tolerating experiences mean that you can stay with your feelings even if they are uncomfortable. For some of you, it also feels threatening when someone shows you caring. Once you know the range of what you can tolerate, hanging out in this zone will increase your experience of well-being and reinforce this connection in your nervous system. Release the traumatic energy bound up in your system. Often this is best done with the help of a therapist. Having an emotionally safe space is so important in processing the feelings and memories in a way that will release this. Experience people who are calm and centred. When you are around individuals who are calm, it calms your nervous system. Our bodies affect each other and are another way to help your nervous system to come out of the fight/flight. Notice that you are not in danger. When you slow down, you can take in much more. Our fight/flight tends to scan quickly because you are looking for danger. Practice as often as you can taking a moment to feel your feet on the ground and noticing where you are and identifying that you are not in danger. Take a calculated risk. Overcoming the mistrust radar requires at some point to start taking risks to open up to people and letting them know who you are. Each time you take a chance, it needs to be one that you can tolerate the outcome. If you push yourself too much and feel too vulnerable, you are likely to end up reinforcing the mistrust radar. Look for inspiration. There are many things out there especially these days on the internet that can provide inspiration. I always find TED talks excellent for this. To hear how people in the world are doing amazing things can increase our faith in the human race. One way of thinking about this is the difference between standing on the sidelines watching life go by vs. engaging and participating in life. So it is critical that you work to release the mistrust that holds you back. When you feel safe, you can relax into your present moment experience. You are open to what is going on around you and how that connects to your inner world. You are not aware in a watchful defence, but a welcome embrace to all that is around you. Your self-absorbed bubble that shuts others out has gone. You can tolerate what comes your way and not be overly concerned with trying to prevent things from happening. You can connect with the world and others with ease and flexibility. Life is all around a lot easier!